The Russian government's state-funded propaganda apparatus runs stories critical of U.S. oil and gas production in an effort to handicap competitors to Russia's state-run energy companies, according to the U.S. intelligence community. The Office of the Director of National Intelligence alleged that RT America, an arm of the Kremlin's foreign propaganda operation, is designed and funded to serve the Russian government's financial and geopolitical interests in a report released on Friday. "RT runs anti-fracking programming, highlighting environmental issues and the impacts on public health," the report noted, referring to hydraulic fracturing, an innovative oil and gas extraction technique. "This is likely reflective of the Russian Government's concern about the impact of fracking and US natural gas production on the global energy market and the potential challenges to Gazprom's profitability." That allegation dovetails with prior statements by public officials in Europe, who say that the Russian government has financed environmental advocacy efforts there with the goal of stymying European competition to Russian oil and gas exports. Fracking has revolutionized oil and gas extraction in the United States, producing a fossil fuel glut that has sent global prices plummeting. That has dealt a significant blow to Russia's energy-reliant economy, which has suffered considerably due to the price declines. According to ODNI's report, RT claims it is separate from the Russian government, but is in fact an integral component of the Kremlin's disinformation campaign in the U.S. and elsewhere. RT's global operations receive $190 million in annual government funding, according to the report. ODNI's report focused primarily on the Russian government's efforts to sway the U.S. presidential election in favor of President-elect Donald Trump. 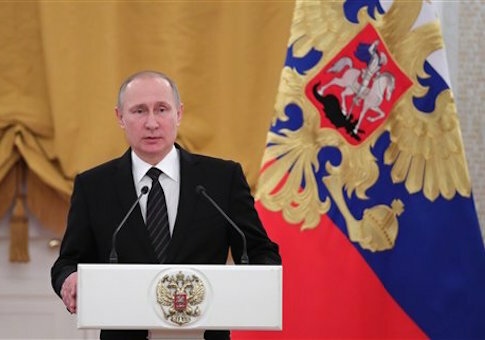 It alleged that Vladimir Putin personally directed efforts to hack Democratic Party organs and "state and local electoral boards." The Kremlin's foreign media operations were integral to that strategy, according to ODNI, but RT's efforts to promote Russian-friendly policies abroad go much further. "RT's criticism of the US election was the latest facet of its broader and longer-standing anti-US messaging likely aimed at undermining viewers' trust in US democratic procedures and undercutting US criticism of Russia's political system," the report found. RT America is particularly geared toward advancing "Russian interests in areas such as foreign and energy policy," according to ODNI. Another frequent target of its programming is U.S. involvement in the Syrian conflict. RT frequently criticizes U.S. efforts to support opposition to ruling dictator Bashar al-Assad. It has also given friendly interviews to the country's embattled president, a Russian ally. On contentious foreign policy issues of direct interest to the Russian government, RT consistently promotes the Kremlin line. It frequently promotes claims that Crimea, a section of eastern Ukraine occupied by Russian forces since 2014, is and should be considered a separate state. It devoted similar coverage to Russia's 2008 occupation of South Ossetia, a territory in northern Georgia. According to ODNI, that coverage is substantially influenced by the Kremlin and staffers hand-picked by the government to run the upper echelons of RT in the U.S. and elsewhere. "The Kremlin staffs RT and closely supervises RT's coverage, recruiting people who can convey Russian strategic messaging because of their ideological beliefs," the report found. The Russian government's heavy hand in the network's oeprations has led to some discontent among current and former staffers, some of whom relayed to BuzzFeed News stories of overt and more subtle massaging of programming to fit the Kremlin's narrative on U.S. and international affairs. "As a journalist there, I can’t even say the word invasion. It was literally cut out of the interview," said former RT America anchor Liz Wahl of her coverage of the invasion of Crimea. This entry was posted in National Security and tagged Cyber Security, Russia. Bookmark the permalink.